Apparently, there is now a name for the least worst Brexit option: "soft Brexit". That said, it is baffling to see British politicians and press talk of a "Norway Plus" model. I think this is a staggering miscalculation: opinions in the EU range from "let's be punitive towards Britain" to "let's give Britain a deal that matches an existing deal with other countries". There is literally no one, aside from British punters, who is willing to contemplate letting the UK carry out Brexit with a special deal that is somehow better than the deal any other country has. When the Brexit negotiations happen, the UK will have to choose which is more important: access to the single market, or opting out of the free movement of people. Seeing pundits speculate about deals that would retain one, while restricting the other, is mind-boggling. Only a very deluded politician or journalist could believe that the UK will get yet another special deal after spitting in the face of the EU. Meanwhile, I continue to make the best of a bad situation, by campaigning for the Norway model. I know that it is the option which would hurt the UK's population the least, and result in no loss of UK citizens' rights. I've started to receive a few replies to the letters I've been sending out to elected representatives. What delighted me most is that some of the replies seemed individual letters rather than form letters / bulk responses. Below the break, you can read the letters and the replies I've received. Jo Stevens is the MP for Cardiff Central. She has actively campaigned for "Remain" before the referendum. 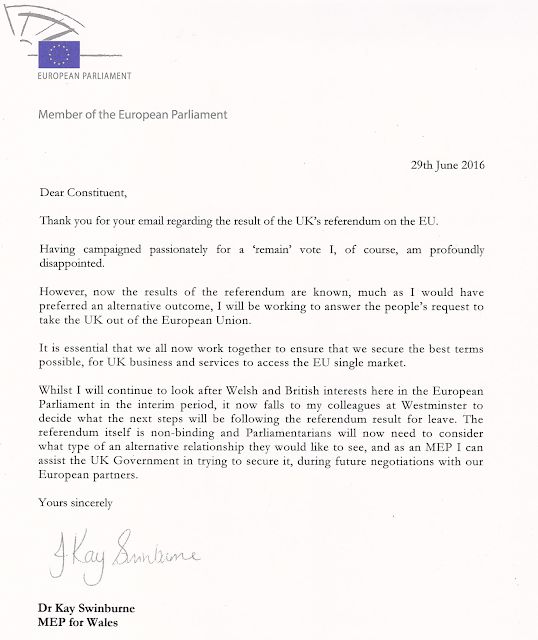 I am writing to you to ask: what will you do to influence the UK’s exit negotiations with the European Union? Which negotiated outcome will you be advocating for? I believe it is of crucial importance and in our national interest that the United Kingdom retains access to the common market by staying in the European Economic Area (EEA). • We need to return to stability rapidly. We cannot afford a decade or more of economic turmoil. • Our economy needs access to the common market. Hundreds of thousands of jobs depend on it – perhaps even millions. • We currently have the right to live, study and work in 28 other nations, without having to undergo any arduous, lengthy application processes. Leaving the EU must not deprive us or our children of this right, and this potential to learn, succeed or retire elsewhere. • Britain’s intended departure from the EU is already damaging our economy. Welsh universities will suffer a drop in recruitment of EU students unless we stay in the EEA. Investors are looking elsewhere, struggling businesses (such as Tata Steel) are less attractive to be sold & reformed, and there are two fundamental threats to our economy: the uncertainty while negotiations happen, and, should Britain leave the common market, the lack of direct access to Europe. The latter could lead to a decade or more of economic instability. Whenever unemployment rises, it is youth unemployment that bears the brunt, heartbreakingly. The UK risks creating a lost generation of young people who will struggle to build decent careers if this happens. Please don’t let it. treatment of Greece in recent years particularly unpalatable. Please let me know what you will be doing to influence Britain’s negotiation with the EU, and what outcomes you will be lobbying and working for. 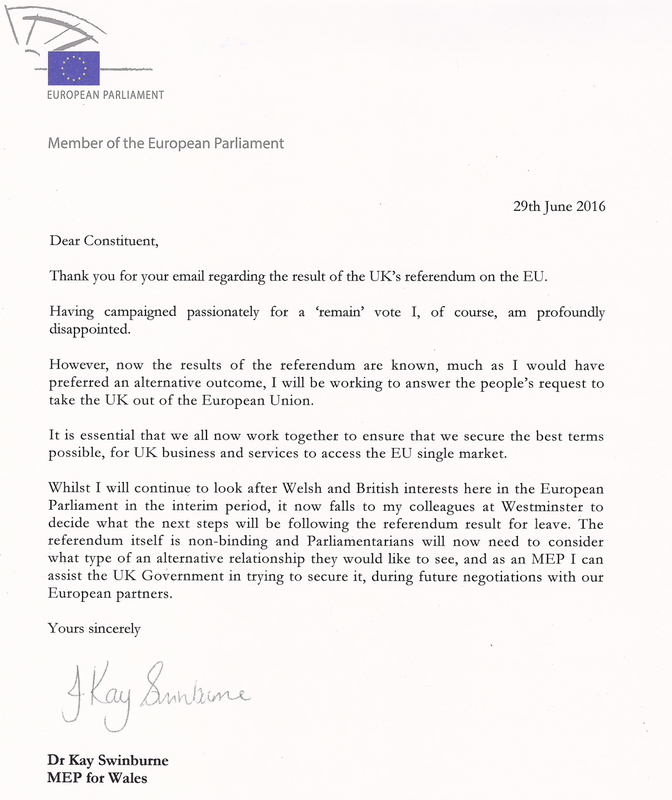 I write to you as one of many constituents who have contacted me following the result of the referendum on the UK’s membership of the European Union. You will know that I strongly campaigned for a very different outcome from the Referendum, and while of course I respect the decision of the country to leave the EU, in Cardiff, we voted by a strong margin of 60/40% to remain, and so I am deeply disappointed at the result. In the two weeks since the result, we have had a malfunctioning government and the UK’s credit rating has been downgraded. The pound has fallen to its lowest level in 30 years, which will have a knock on effect on the cost of our imported goods and products, including food and petrol. Jobs and living standards will soon be hit hard as a direct result. Some major companies have already begun to transfer jobs abroad and I know from speaking with small business owners in the constituency, that there will be serious negative consequences for many of them. Xenophobia and racially motivated hate crime have already begun to rise dramatically, Scotland is working towards leaving the UK with Northern Ireland making similar noises, and, following the Prime Minister’s resignation, we face a right-wing Tory government in charge of the exit negotiations. The idea that a right-wing Tory government would fight for us to retain protection of our human rights, our rights at work, our environmental protections, or for investment in the areas of the UK most in need, is laughable. But, clearly, many communities across our country do feel excluded from the political process and from their fair share in the wealth of this country. 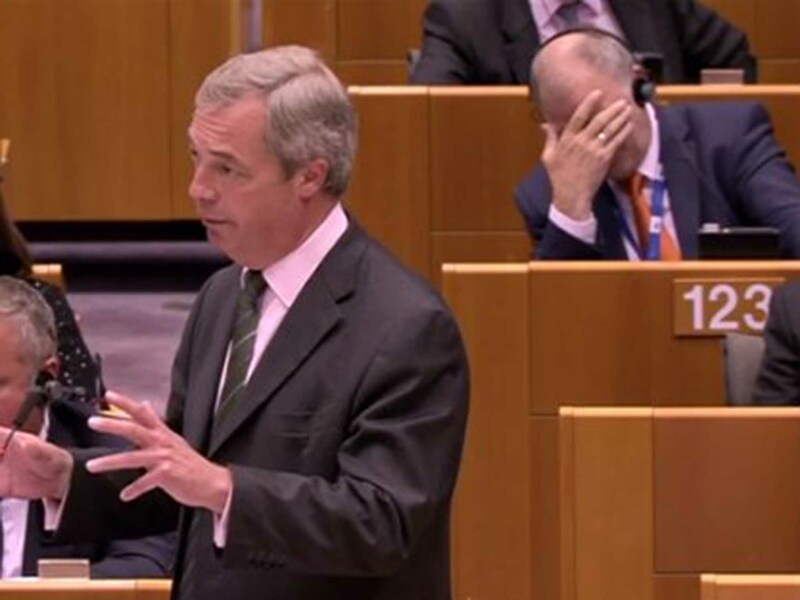 This feeling was viciously exploited by the Leave campaign, with the support of much of the right wing press. Despite our efforts, therefore, the Leave campaign was able to get away with a shameful and divisive campaign based on misrepresentations and lies. Nonetheless, despite my deep disappointment about the outcome of the referendum, I know that we must respect the result. Failing to do so would risk even more voters turning towards UKIP or other ultra right-wing parties. Instead, MPs from all parties need to listen to people’s concerns (both real and perceived) about job insecurity, immigration, the devastating impact of austerity, and the decline of our public services, and find the compelling solutions that respond to their real concerns. As you will be aware, formal negotiations will not begin until the Article 50 exit clause is triggered by the UK and David Cameron has stated that this will be for the next Prime Minister to implement. I’m afraid I can’t speculate on when this might happen as there could be a General Election even before the next Prime Minister is in a position to consider this. But whatever the timetable, and the eventual outcome of our negotiations, it is absolutely essential that we remain on the best terms possible with our closest EU neighbours so that we can negotiate the strongest deal for jobs, for pensions, for trade, our university sector and all our public services. We must also work to maintain all possible opportunities for our young people whose futures will be most profoundly affected by the referendum result, as well as the many EU nationals living in the UK who make such a huge contribution to our economy and our communities and need urgent reassurance from the government about their status and future here. That is why the Labour Party forced a vote in Parliament on such a commitment to EU nationals last week which was successful. It's also essential that the views and concerns of those of us who did not vote to leave, are properly represented and influential in those discussions and negotiations. I have received hundreds of emails on this issue and I hope this reply assures you of my position on the basis of knowledge about the current situation. However, if your concern hasn’t been addressed in this reply then please do not hesitate to get back to me. Andrew Davies is the Leader of the Welsh Conservatives and member of the Welsh Assembly. He campaigned for 'Leave' and issued a statement about the referendum outcome on his website. • We need to return to stability rapidly. We cannot afford years of economic turmoil. • No one will buy Tata Steel if we leave the common market - thousands of Welsh jobs are on the line! existing ex-pats should not suffer, either. • Britain’s departure from the EU is already damaging our economy. Investors are looking elsewhere, struggling businesses (such as Tata Steel) are less attractive to be sold & reformed, and there are two fundamental threats to our economy: the uncertainty while negotiations happen, and, should Britain leave the common market, the lack of access to Europe. The latter could lead to a decade or more of economic instability. Whenever unemployment rises, it is youth unemployment that bears the brunt. The UK risks creating a lost generation of young people who will struggle to build decent careers if this happens. Please don’t let it. I understand that the Norwegian model will include freedom of movement and may not achieve big changes to immigration, but if it preserves Britain’s prosperity, then we must accept that. I also understand that it is likely to involve payments into the Norway funds for regional development in the EU. If it preserves British livelihoods and stops us from suffering a lost generation of unemployed young people, then that too is a price we will have to accept. As you will be voting for a successor for David Cameron, I ask that you please only support candidates who indicate up front that they will negotiate to keep the UK inside the EEA. Please let me know what you will be doing to influence Britain’s negotiation with the EU, and what outcomes you will be lobbying and working towards. Thank you for your e-mail following the outcome of the EU referendum. While it is clear that a majority of people voted to leave the European Union, and as such the democratic will of the British people is carried out, it is vital that we do all we can to bring the country together. It is important to show both humility and magnanimity at a time when 48% of the country did not vote for the preferred outcome, and so we must do all we can to get them on board as we seek to secure a better future for our country. It is therefore of vital importance that both Leave and Remain campaigners take on prominent roles in the next government, and that we establish a strong negotiating team to get the best possible deal for Britain. 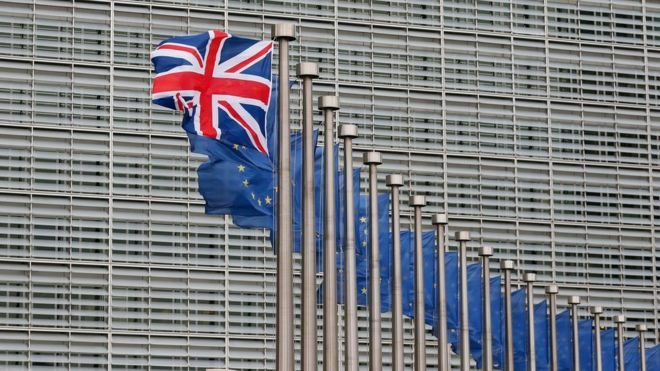 Ultimately, negotiating our exist from the European Union will be the responsibility of the next government and the next Prime Minister, and it will be a prevalent theme over the coming weeks as we see the candidates putting forward their ideas on this will best be achieved. Once again, thank you for taking the time to contact me about this issue, and I hope that this response is helpful. If I can be of further assistance, please feel free to get in touch. Derek Vaughan is a Member of the European Parliament, representing Wales and the Welsh Labour Party. He has written about the Referendum Outcome and its impact on Wales on his website. • Britain’s departure from the EU is already damaging to our economy. Investors are looking elsewhere, struggling businesses (such as Tata Steel) are less attractive to be sold & reformed, and there are two fundamental threats to our economy: the uncertainty while negotiations happen, and, should Britain leave the common market, the lack of direct access to Europe. The latter could lead to a decade or more of economic instability. Whenever unemployment rises, it is youth unemployment that bears the brunt, heartbreakingly. The UK risks creating a lost generation of young people who will struggle to build decent careers if this happens. Please don’t let it. Thank you for your email, certainly there are some models that would be better than others. However, as we would not be eligible for structural funds under any deal I still feel that it would be disastrous for Wales if we were to leave the EU, and I have no faith in the current Government to replace that funding. The result places a hard decision in the hands of Members of Parliament which as a Member of the European Parliament I cannot necessarily influence. Though I was against this referendum, I accept that 53% of the population of Wales decided to vote in favour of leaving the European Union and that cannot be simply disregarded. I believe people have the right to make choices about their lives. However, we must also accept that the choice they have made will cause significant suffering, robbing futures, losing jobs all without solving any of the problems that affect people’s lives. The leave campaign has been damned in their own words, they lied to people about what would happen, or at the very least deliberately gave the impression that certain things would happen when they had no intention of making those things happen. With this in mind, it seems quite clear and bearing in mind the political chaos that is now engulfing the Conservatives that we cannot simply walk out of the EU with no road map and on the basis of lies. I feel this particularly strongly in Wales, we voted for out yet I know the damage it will to our country, the meaningful jobs that will disappear, the high quality apprenticeships that will disappear and the incredible schemes that will disappear when the UK government inevitably cannot replace the money that they cannot get. Dr Kay Swinburne is a Member of the European Parliament, representing Wales and the Conservative Party. Her reaction to the referendum result can be found on her website. Dr Röttgen is the chair of the Auswärtiger Ausschuss (Foreign Affairs Committee of the German Bundestag). He has also written an article on his website about the future of the EU after the referendum outcome. Ich schreibe Ihnen aufgrund der Volksabstimmung im Vereinigten Königreich, und dem vermutlich bevorstehenden EU-Austritt. Sollte Grossbritannien offiziell den Austritt einleiten, möchte ich sie bitten, bei der deutschen Regierung darauf einzurwirken, dass Grossbritannien und Nordirland in der Europäischen Freihandelsassoziation und im Europäischen Wirtschaftsraum bleiben können. Ich bin ein Deutscher Bürger und lebe seit 16 Jahren in Grossbritannien. Egal wie der Austritt geschieht, ich erwarte keine Probleme: ich kann mich einbürgern, oder auch in ein anderes europäisches Land auswandern. Mir geht es um meine britischen Bekannten und Freunde. So gut wie alle haben für die EU gestimmt. Alle sind schockiert. 16,141,241 Wähler wollten in der EU bleiben – weitaus mehr als bei den Wahlen in 2015 für David Camerons Partei gewählt haben (11,334,576). Die EU ist somit beliebter als die hiesige Regierung! Diese Briten verdienen die Solidarität Europas. Sie protestieren, sie geben sich Mühe, den rassistischen Übergriffen die sich seit der Abstimmung vervielfacht haben, entgegenzuwirken, und sie sorgen sich darum, dass die Jugend dieses Landes den automatischen Zugang zu einem ganzen Kontinent verlieren wird, wenn der Austritt geschieht. Sie sind von dilettantischen Politikern hierzulande im Stich gelassen worden, und fürchten, dass Camerons Nachfolger sogar noch dilettantischer sein werden. Ich stimme den deutschen Ministern zu, die angedeutet haben, dass Grossbritannien keine Extrawurst bekommen soll. Mitgliedschaft im Wirtschaftsraum bedeutet Bewegungsfreiheit, und Beiträge in die EEA Grants und das ist auch richtig so. Ich bitte Sie also nicht darum, eine Sonderlösung für Grossbritannien anzustreben. Ich bitte Sie lediglich darum, dass Sie darauf einwirken, dass Grossbritannien dieselbe Beziehung zur EU angeboten wird, wie Norwegen sie hat. ich danke Ihnen ganz herzlich für Ihre Email und Ihre Eindrücke und Erfahrungen, die Sie aus Großbritannien schildern. Ich bin ganz Ihrer Meinung, es hat keinen Sinn und liegt auch nicht im europäischen Interesse, unnötig Druck auf Großbritannien aufzubauen. Ich bin dagegen, Großbritannien abzustrafen. Eine norwegische Lösung wird dem Vereinten Königreich sicherlich angeboten werden und ich wäre - auch im Interesse aller Briten, die für Remain gestimmt haben - froh, wenn die britische Regierung dies annehmen würde. Franz Thönnes is a member of German parliament and the Deputy Chair of the Foreign Affairs Committee of the German Parliament. As you can see below, he asked Norbert Spinrath, another member of parliament and spokesman on European Matters for his party, to reply to my message on his behalf. mein Kollege Franz Thönnes bat mich, Ihnen als zuständiger Europapolitischer Sprecher der SPD-Bundestagsfraktion auf Ihre E-Mail zum Brexit zu antworten. Zunächst danke ich Ihnen für Ihre E-Mail. Auch mich hat der Ausgang des Referendums zutiefst bestürzt. Im Interesse aller Bürgerinnen und Bürger müssen das Vereinigte Königreich und die Europäische Union nun schnell wieder handlungsfähig werden. Das Vereinigte Königreich muss entscheiden, wie es zukünftig mit der EU zusammenarbeiten will. Dies geht entweder nach den Grundregeln der WTO oder es akzeptiert, ähnlich wie die Schweiz oder – wie von Ihnen angesprochen – Norwegen, sich den Regeln und Pflichten des Binnenmarktes - und damit auch der Arbeitnehmerfreizügigkeit - zu unterwerfen und deutliche höhere finanzielle Beiträge zu leisten, als das Vereinigte Königreich derzeit an EU-Beiträgen bezahlt. Gleichzeitig entfallen dann aber jegliche Mitsprachrechte. Großbritannien kann weiterhin ein wichtiger und enger Partner der Europäischen Union bleiben. Aber unter den oben geschilderten Bedingungen. Mich persönlich würde es sehr freuen, wenn die Menschen in Großbritannien einen Weg zurück in die EU finden. Ich kann mir eine EU ohne sie immer noch nicht wirklich vorstellen.